For small business people few endeavors are as productive as attending, or presenting at, a conference. The value is not restricted to meeting and networking with thousands of industry leaders, or even rubbing elbows with veritable business icons. And naturally, you learn a great deal. One of the greatest takeaways is in the Ah-ha! moments. Epiphanies that take your breath away, when a thought leader says that one thing that makes everything fall into place. It's that moment everyone remembers; the one everyone will be talking about for weeks. Not every speaker will deliver the same impact. Ah-ha moments require a powerful, charismatic speaker, a startling, but understandable revelation. One of my favorite Ah-ha speakers is tech superstar Guy Kawasaki. He's smart and funny, and he delivers esoteric concepts in a down-to-earth way. Can innovation be taught? I'm not sure. As Guy points out, not every idea is a good one. But while he cannot tell you how to come up with a good idea, he can certainly teach how to recognize a bad one. 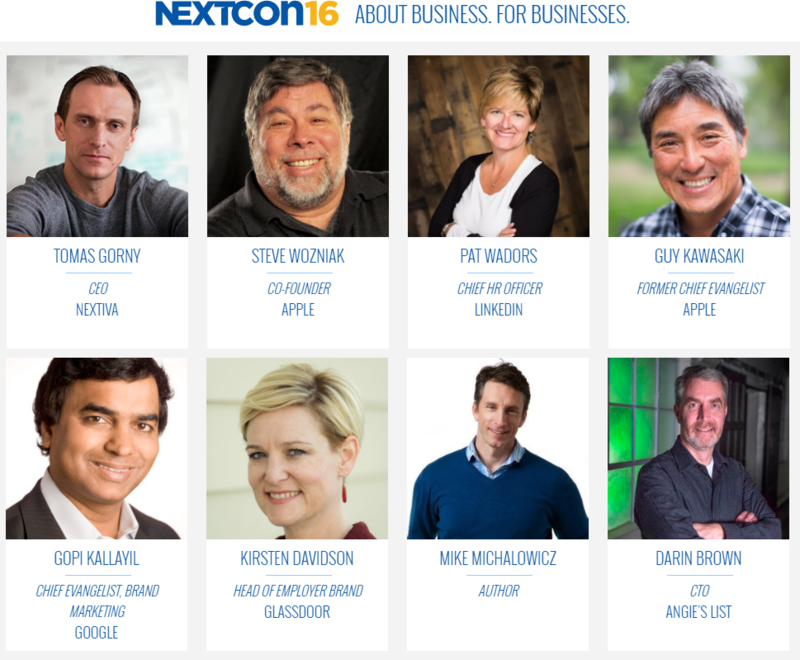 November 14-16, 2016, Guy Kawasaki will be at NexCon16, delivering Ah-ha moments in the company of another of my business heroes, Steve Wozniak. Yeah. The Woz. Co-founder and tech wiz of Apple. A host of other business luminaries will grace the stage, delivering a whole lot of Ah-ha moments from a diverse array of industries and businesses. Hosted by Nextiva, a rapidly growing cloud-based unified communications service, the conference is designed to enlighten entrepreneurs, small business owners, tech professionals, and anyone does business online or off. 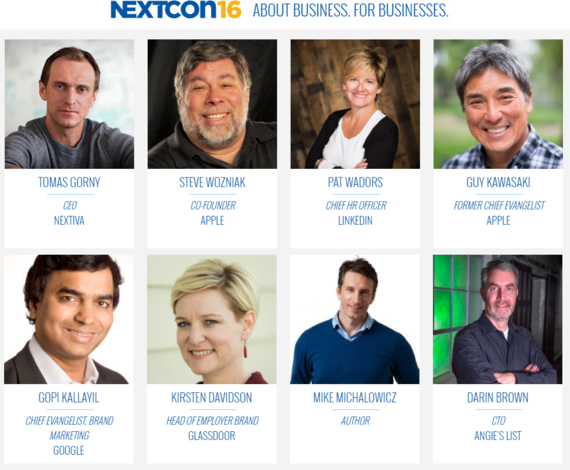 With 50 speakers over three days, Nextcon will offer something for everyone. Immediately following the welcome session on the first day of the conference, Guy Kawasaki kicks off the conference with "How to Jump the Innovation Curve" - a presentation guaranteed to be full of insight, wit, and wisdom. Later, attendees have the opportunity to attend a "fireside chat" with Darin Brown, CTO of Angie's List, Scott Gerber, founder of CommunityCo, Neill Feather, president of Sitelock, and Carol Roth, TV host and CNBC contributor. The conversation will center on overcoming challenges to achieve growth. After lunch, Tomas Gorny, CEO of Nextiva, takes the stage to talk about The Future of Business Communications." With his experience as an industry disruptor and serial entrepreneur, Gorny is certain to light up the crowd about what's in the future on the communications front. Chief Evangelist, Brand Marketing, Google. In charge of building some of the most powerful brands in the world, Kallayil will share insights about building a brand and keeping it relevant. Next up, marketing legend, Larry Kim, founder of Wordstream, who will present "5 Ways to Innovate with Paid Search." Kim will cover unique strategies for search engine marketing. Discussing a subject near and dear to my heart, a panel of SEO experts is up later in the day with "SEO Powerhouse: Excelling at Organic Search." Day two continues with expert-led presentations and panels centered on marketing, social media, company culture, women in business, video production, data management, and growth. Day three continues with the varied-interest theme, beginning with email marketing and inspiring young people to pursue tech, providing amazing customer service, leading into "Organizations of the Future" presented by Pat Wadors, Linkedin's chief HR officer. Speakers, panels, workshops, and a roundtable marketing discussion are packed into the day, ending with a full hour of Woz, speaking on "Creating a Culture of Innovators." Afterward, attendees get up close and personal in an informal session with Steve Wozniak. The conference closes with "NextCon: A Look Back, A Look Ahead," a roundup of topics covered, drinks, and some extra networking time. At $499, NextCon16 is a bargain for small business looking to maximize value for their networking ad education investment. NextCon16 takes place at the Talking Stick Resort in Scottsdale, Arizona, Nov. 14-16, 2016.